Kindness is like a boomerang if you throw it often, it comes back often. 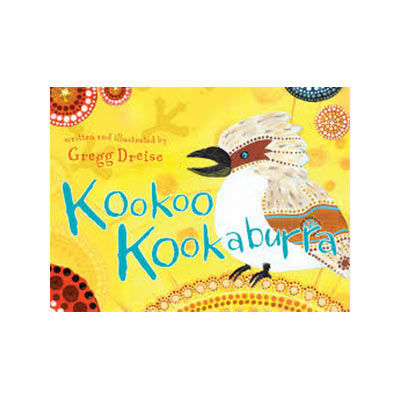 Kookoo the Kookaburra is the second heartwarming morality tale – set within the cultural context of the Dreamtime by Queensland teacher Gregg Dreise. In the same vein as his first book Silly Birds (Magabala Books 2014) Dreise tells the story of Kookoo, a kind and well-loved kookaburra who is famous for entertaining the other bush creatures with his funny stories. Everyone knows Kookoo has a special gift because he can tell funny stories about the other animals without hurting their feelings. However, when Kookoo runs out of kind stories he turns to teasing and making fun of his friends’ differences. Refusing to listen to the sage advice of his uncle, Kookoo gradually alienates all his friends until he finds himself alone and ignored by the other animals. When he finally listens to the sounds of his own laughter echoing around the bush and realises it has become an unhappy sound, Kookoo is forced to remember his uncle’s words and change his ways kindness is like a boomerang if you throw it often, it comes back often.